Here is a showcase of some of the past events I have created. 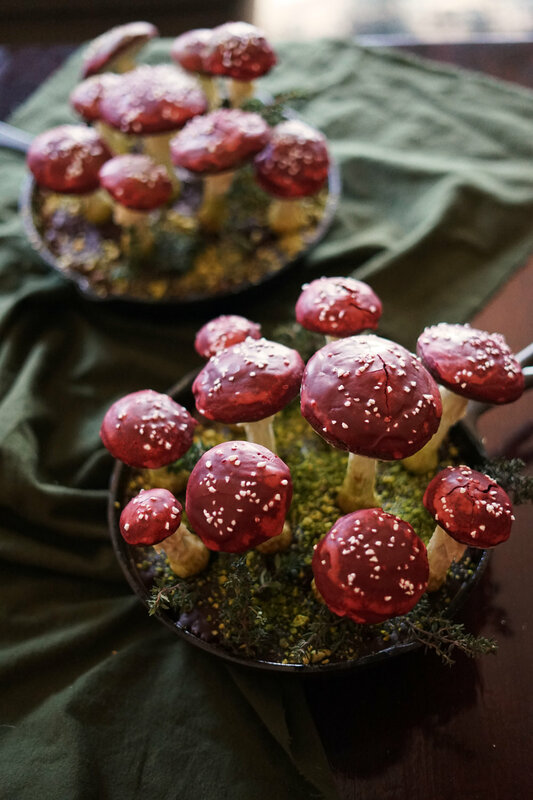 Each event is designed to gift my guests with a memorable experience full of natural flavors and foraged ingredients. 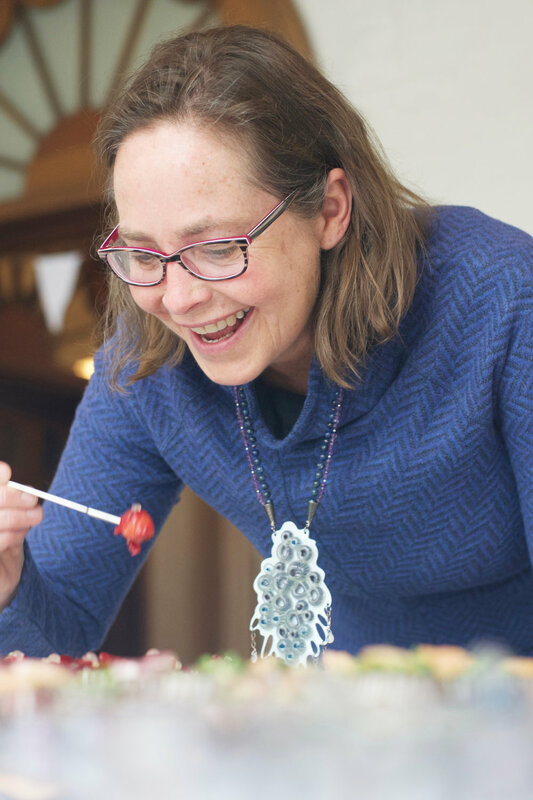 I design each event with a specific purpose in mind, whether that is to encourage child-like play, excited discovery, or intense relaxation. 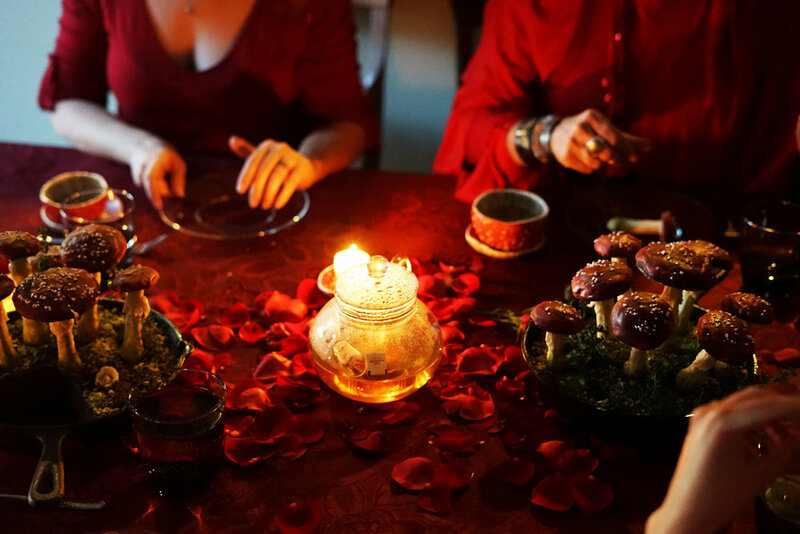 On a misty spring evening, I shared an ethereal tea party inspired by the magic of liminal spaces with a stranger. 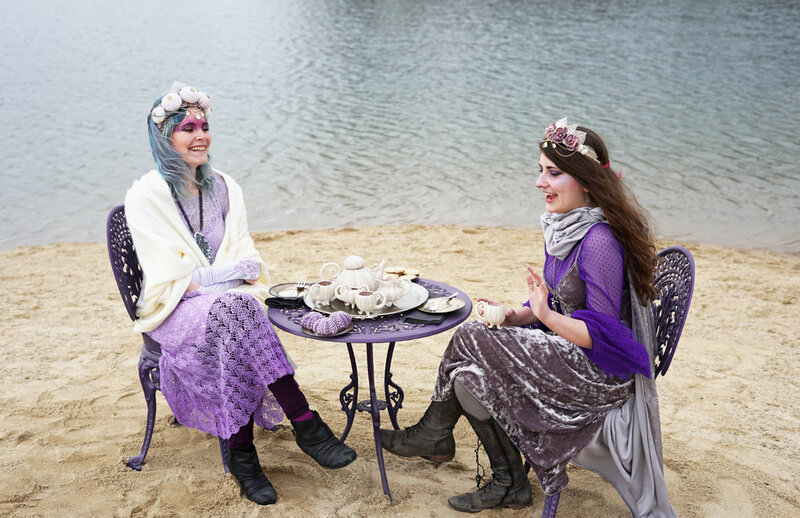 Over tea and treats (served from handmade ceramic artwork, of course), my guest and I discussed the feeling of being in a state of liminality - of fairy doors behind waterfalls, the call of a creative life, the ungroundedness of moving, and much more. My guest, Maria, was selected from a group of shared stories about liminality. (I put the names of everyone who entered into a hat and let fate help me pick her.) She was gifted with a shell crown worthy of a mermaid to remind her of our conversations as she moves through her own time of liminality and discovery. 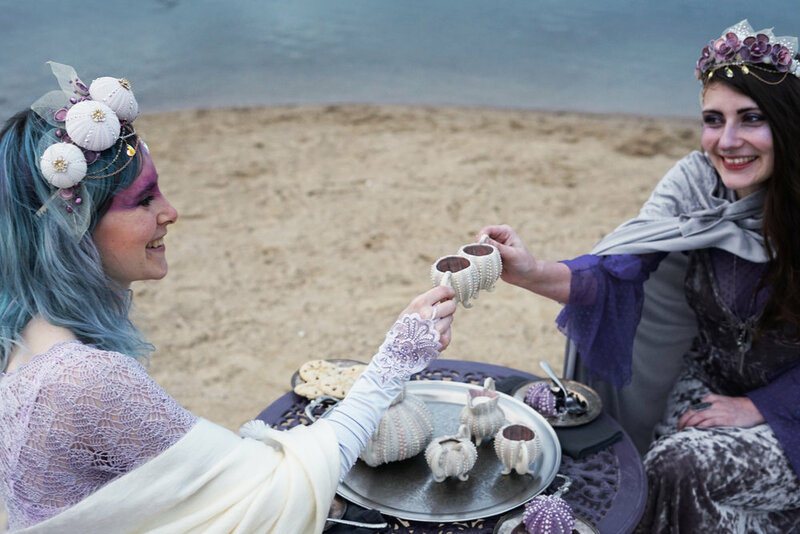 She traveled across two states to meet me for this magical sunset tea. I hope it was as special to her as it was to me! Photos by Craig Crist. Huge thanks to my generous patrons who make all of these events possible! The darkest nights of midwinter are a time of mischief…of bright red fairytale mushrooms beckoning you ever further into the dark woods towards fairy circles and passages to other realms, of Persephone donning her scarlet cloak and descending into the earth to once again feast on sumptuous fruits and garnet seeds as she balances spring’s bloom with hell’s fire, of little flashes of red elfin hats dashing down chimneys on their mission to play tricks on the cruel or bestow gifts on the kind, of the very liquid in our veins that ties us to the ancient rites and rituals that mark the magic of winter, one ruby drop at a time. 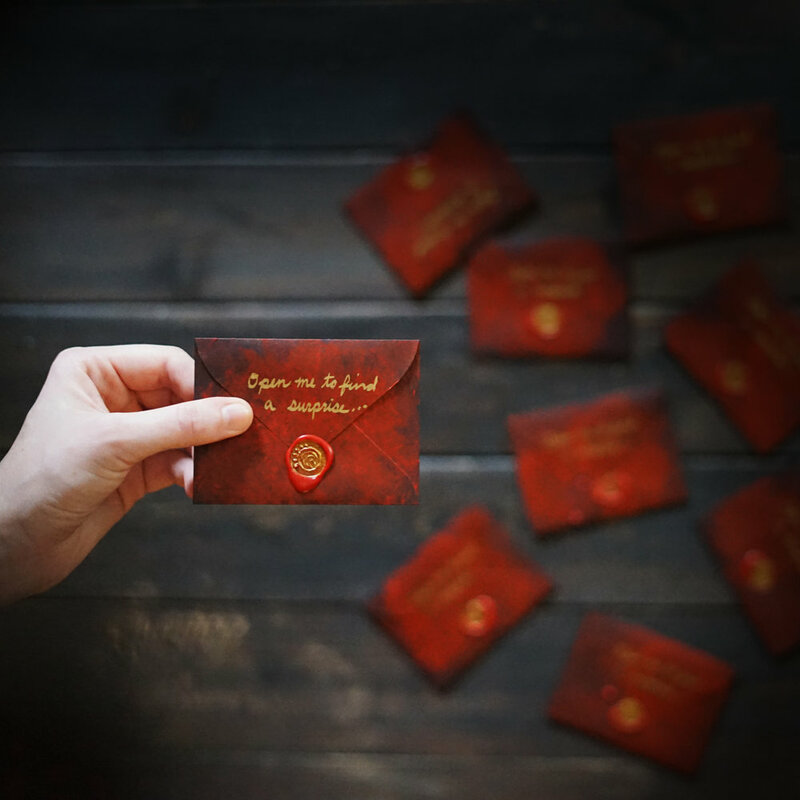 A gathering of friends and strangers (who’d found little red envelopes tucked into sketchbooks) appeared around my table on a cold winter’s day to discuss the question “What is in your blood?” In-between courses of hearty red food, we responded to questions and prompts in our sketchbooks. 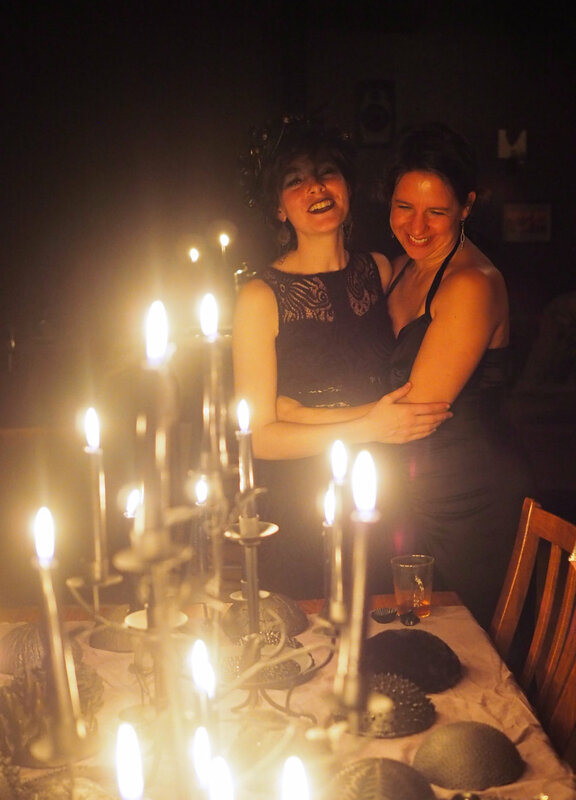 It was an exercise in creativity, community, and that scarlet magic of midwinter. See more photos (plus descriptions) on my Facebook Page. Big thanks to the volunteers that helped me with this event, Lucy Chronic and Craig Crist. So much gratitude, as always, to the Patrons that make events like this possible! 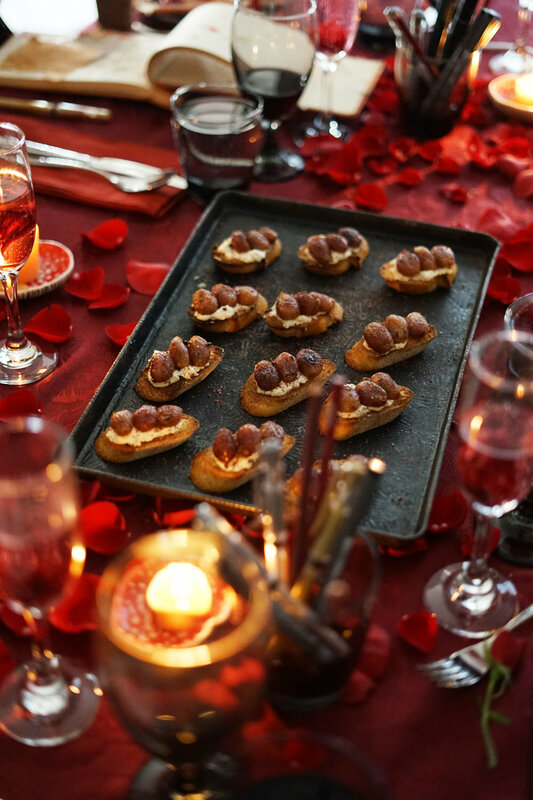 This pop-up dinner party was a celebration of the diversity of holiday festivities. From Menorahs to Manger Scenes, Basque flags to Polish dolls, Rice Pots to Pomanders, it was awe-inspiring to see such a beautiful demonstration of humanity, all sparkling with winter lights. Cultural Ambassadors applied for their seats, then were able to invite a few of their friends. Everybody brought their own picnic supplies (including a thermos of soup) and we set up our banquet in a public park decked out for the season. It was so wonderful to bond over exchanged cards, nostalgic memories, and a warm meal on a cold winter’s night in central Idaho. I also loved being able to interact with passers-by and tell them about our purpose as we gathered together: to illuminate diversity and spread a little mid-winter light in doing so. 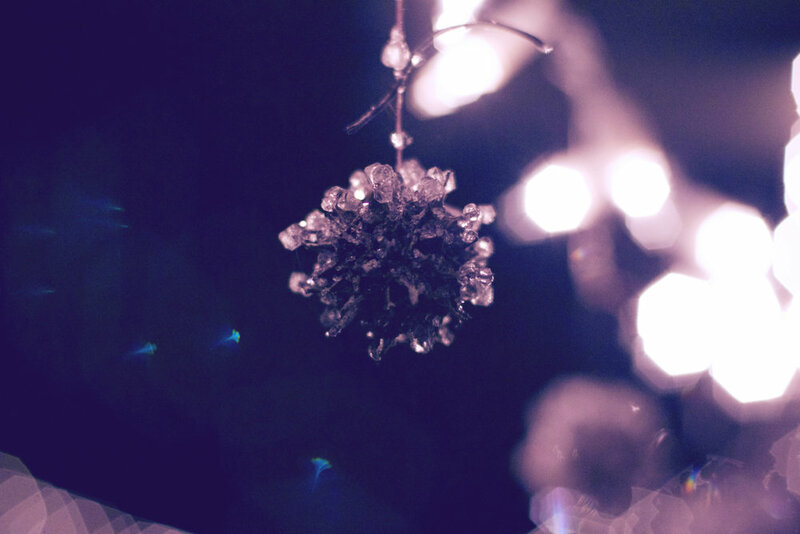 Huge thanks to The Glitter Projects for donating a bonus pre-party full of sparkly makeovers! I also couldn’t have done this without my faithful team of volunteers and magic-makers: Chelsea Santiago, Craig Crist, Lucy Chronic, and Chris Hinze. In a world of text messages and brief emails, taking the time to write down our feelings for those we care about is a beautiful act of intimacy. 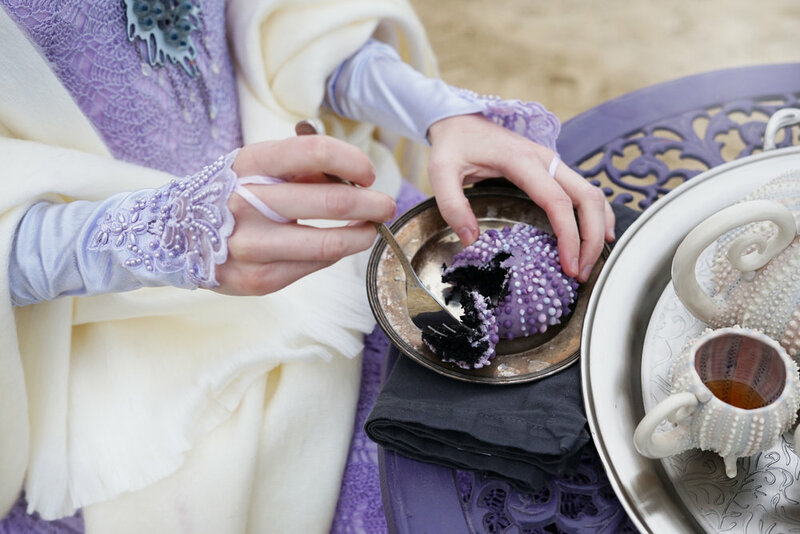 This event was inspired by a series of teacups and saucers I created on a whim inscribed with little snippets of poetic expressions of love. 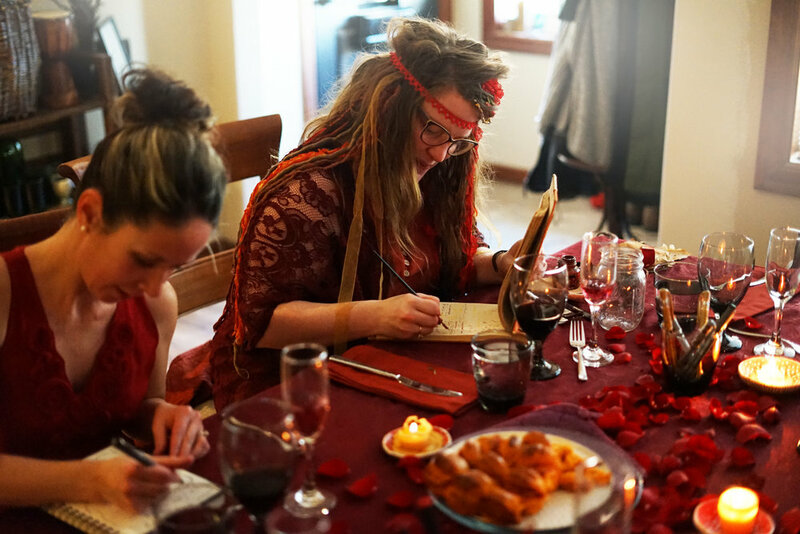 Guests earned their way to attend this event by submitting a love story in 15 words or less. 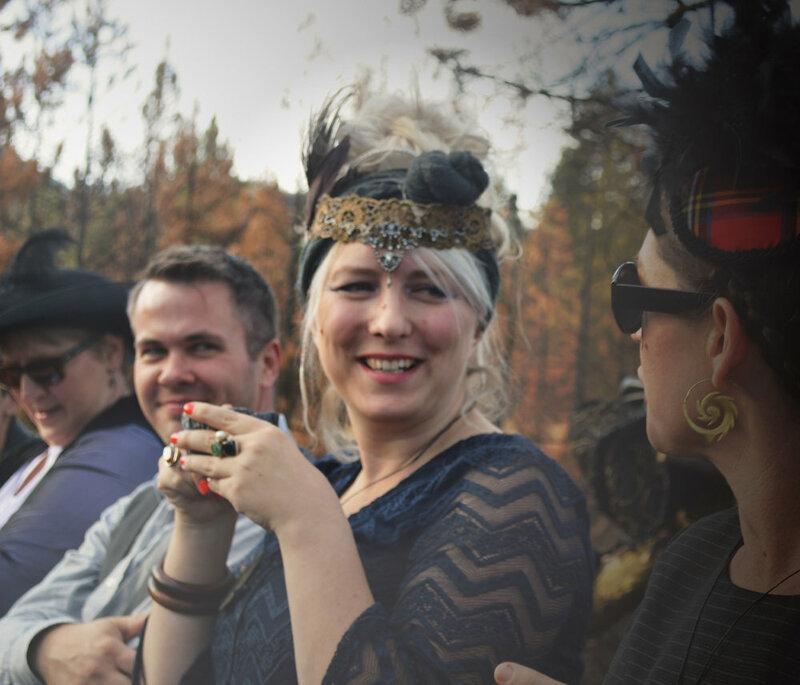 On a sunny morning in the foothills around Boise, Idaho, we joined together amongst the sagebrush to celebrate love in all its forms around a delicious brunch. We told stories both of giving and receiving love. We talked about the importance of vulnerability. We even crafted our own ceramic tokens to give to a loved one! And, we ate a lot of quiche. 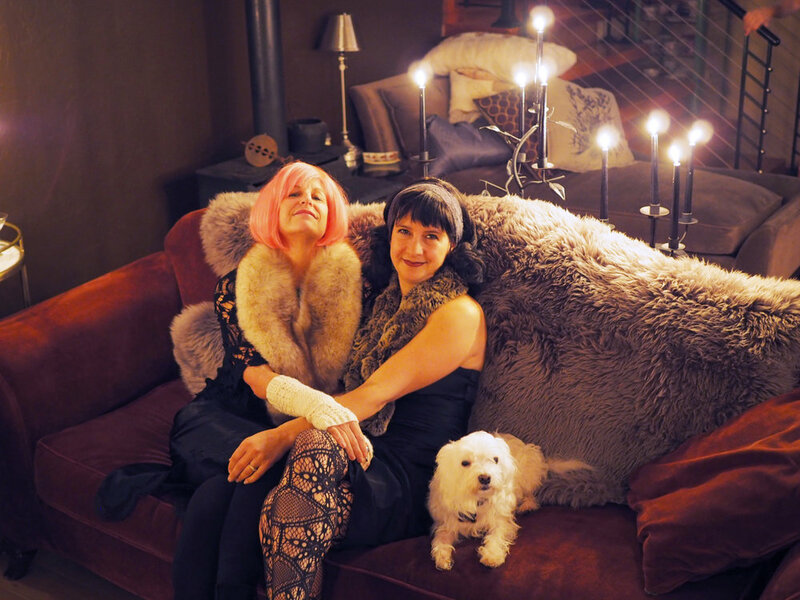 Huge thanks to my co-Wondersmith “Sage” for helping me plan, execute, and photograph this special event! You can see a more detailed description of this event in its Facebook album. The wonder of cracking open a boring-looking rock to reveal a sparkling geode was the inspiration for this event. 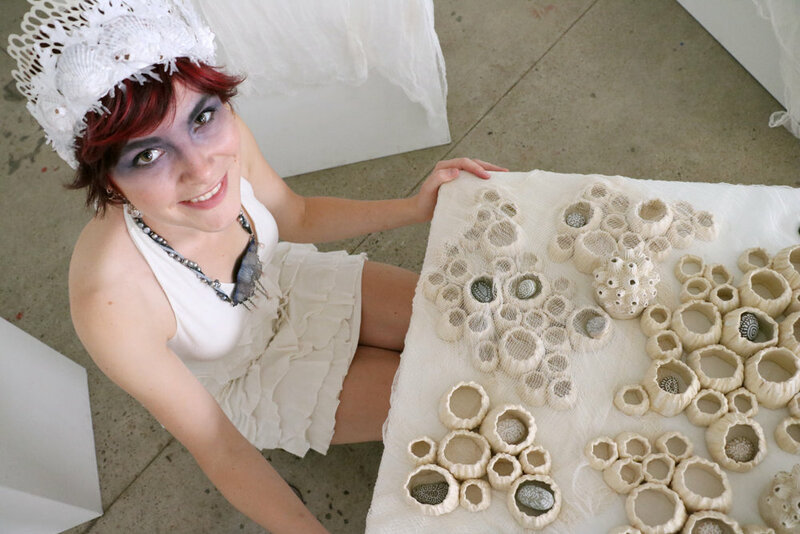 Invitations were tucked into ceramic geodes left in public places inviting those lucky enough to stumble upon them and adventurous enough to crack them open to a magical event deep within the earth, down in the Kuna Caves near Kuna, Idaho. Guests descended down a tall ladder and then together we dined on little geode appetizers, colorful root vegetables covered in herbs and baked in clay (which we smashed open with hammers and topped with a variety of colorful sauces), and finally edible confectionary geodes with platters of fresh fruit. A spelunking adventure deeper into the lava tube caverns revealed extra hidden treasures: handmade glass crystal sculptures. 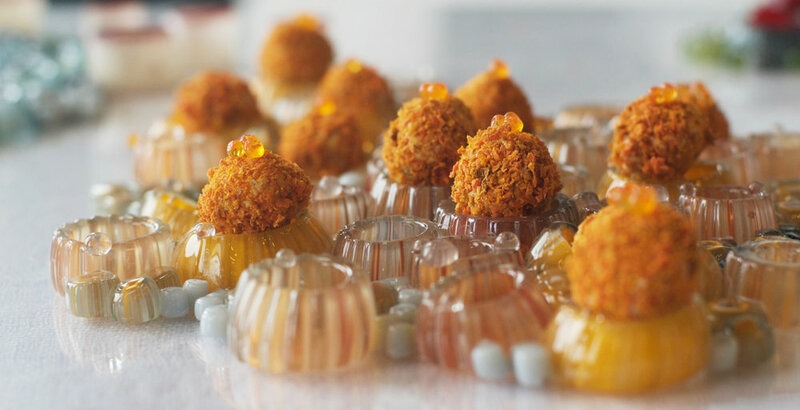 It was an afternoon of excited wonder and discovery celebrating the treasures found deep underground, from tasty roots to sparkling crystals to memorable adventures. There is beauty in the darkness. It’s a place of vulnerability and sensual exploration; with darkness comes a richness that disappears in the light. 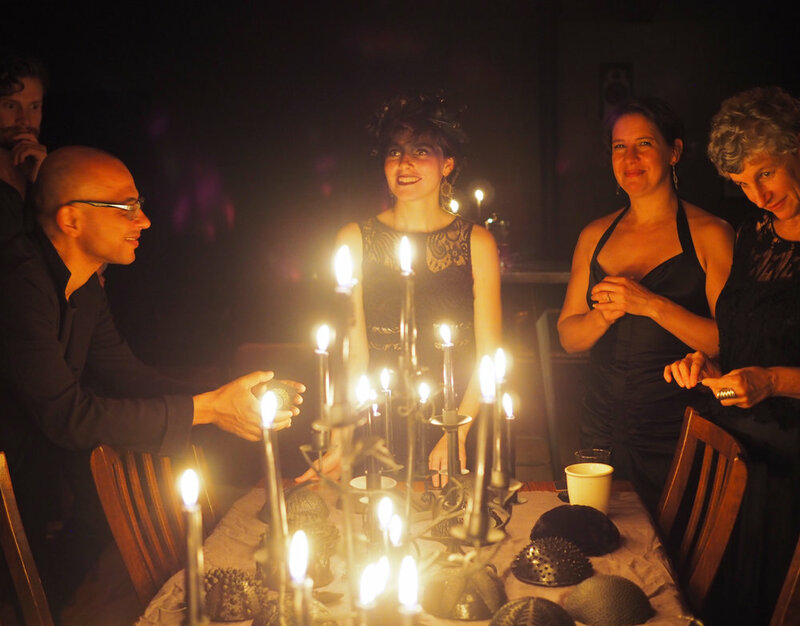 A few lucky guests were treated to a magical evening exploring these themes, from blindfolded dancing exercises, to a delicious meal served entirely in the dark, to chocolate truffles hidden under textural bowls illuminated by black candlelight. 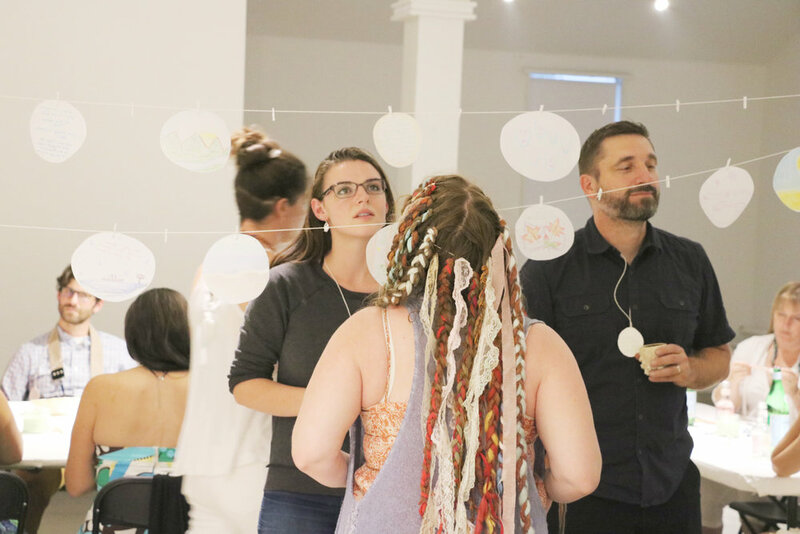 These guests earned their way to this free event in the most peculiar of ways: by asking permission to touch a specific soft sweater (indicating both that they were of a tactile nature and had a healthy understanding of personal space and boundaries.) On the eve of a new moon as the nights noticeably lengthen, we surrendered to the darkness and the secrets it contains. 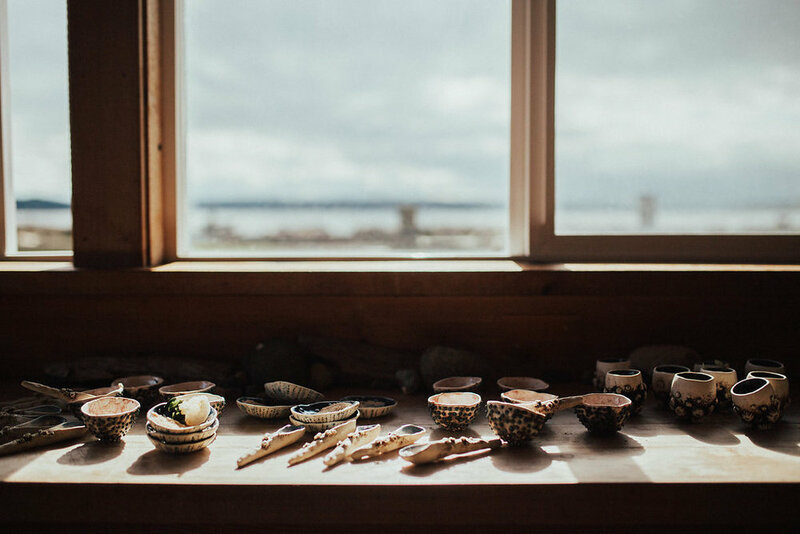 What if you could distill a Collective Pacific Northwest late summer nostalgia into a few elixirs and artifacts to conjure up sweet memories of times long past? One last trip to the beach before the warm nights of summer give way to the chill of fall. One last time poking in tidepools, collecting shells. One last ice cream cone. One last day of blissful freedom. That’s the experience I shared with the guests at “Ephemera”. Guests found their way to this interactive event by participating in a city-wide treasure hunt to search for clues to a secret password to RSVP to this event.. 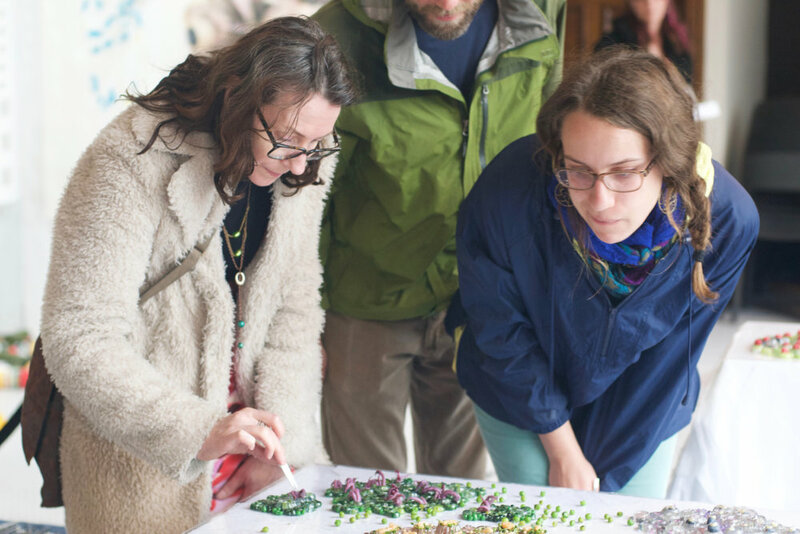 When they got there, they foraged the contents of a nostalgia ice cream sundae from a tidepool-inspired art installation. Volunteers served up ice cream with “elixirs of nostalgia”; flavors such as “s’mores over the campfire in the mountains”, “fresh-cut grass and grandma’s flowers”, and “making blackberry jam.” After the treats were consumed, guests distilled their own nostalgic memories further with some writing activities. 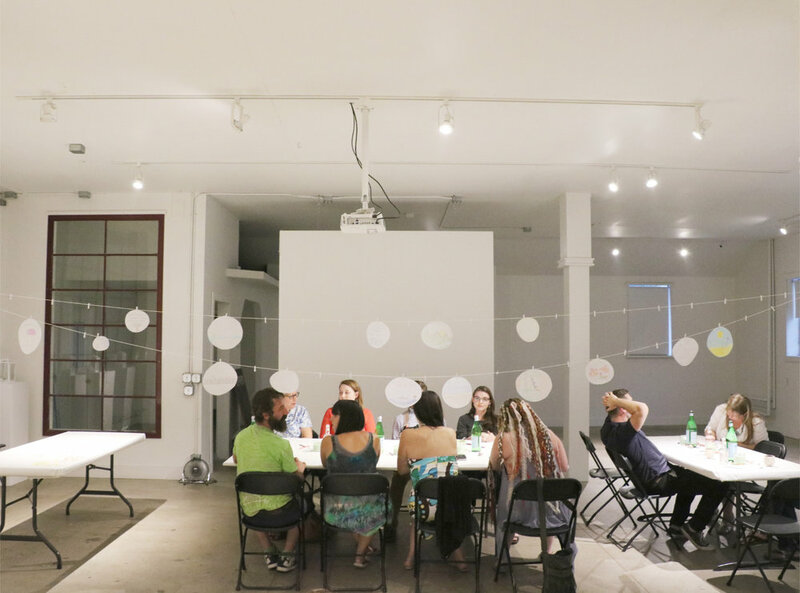 They wrote snippets of their own youthful memories on translucent vellum, which was hung to create a collective installation, available to the public for viewing the next night. All of this was conducted through an artful ceremony. Together we shared a wonderful evening of storytelling, ice cream, and nostalgic memories. Did you know that most languages develop a word for the color “blue” last? We may think of the sky and water as blue but there are very few things found in the natural world that are truly, tangibly blue. That means that when we stumble upon them we are surprised and delighted- think of the joy of finding a cracked Robin’s eggshell or a blueberry bush laden with fruit! 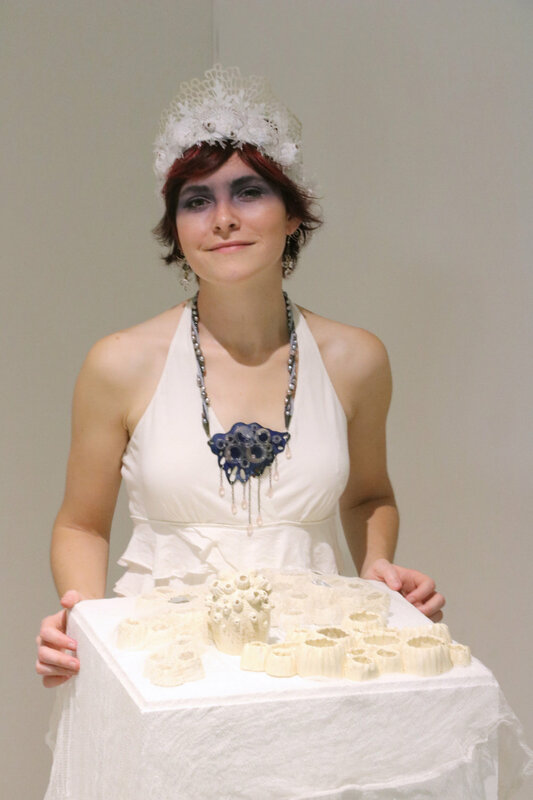 This event was a celebration of the color blue, of springtime and fresh starts and new wings. It was held at the Tamolitch Blue Pool in central Oregon, a natural wonder that consists of a pool that looks sapphire blue in color. Invitations disguised as large blue eggs were hidden along the trail and the lucky hikers that found them were invited to join a picnic on a cliff overlooking the sparkling pool. 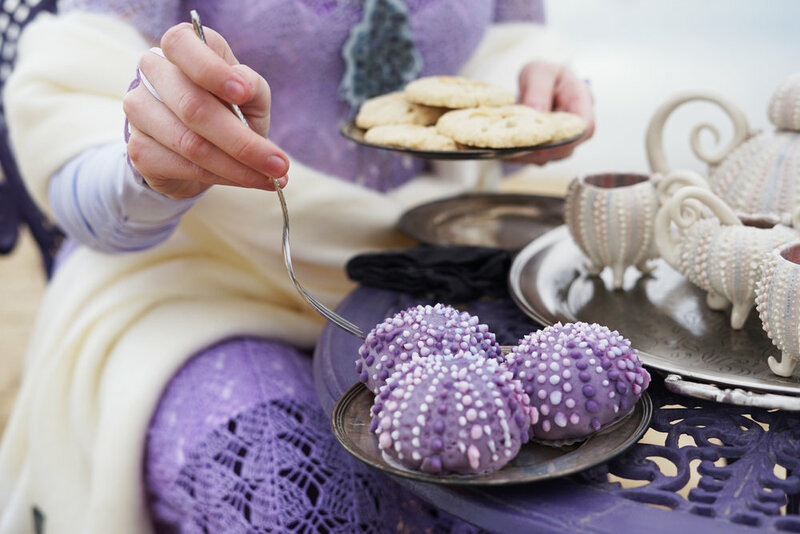 There they dined on all manner of naturally - blue foods, from dark indigo blueberry cake to a bright blue iced tea. The artwork I created for this event was inspired by other sources of natural blue in our Pacific Northwest world: the tiny blue butterflies that live in the mountains, and the shimmer of blue bird’s wings. It was held on Mothers’ Day, an extra magical surprise for the families hiking that particular trail on a beautiful spring day. You're walking along the seashore enjoying the late afternoon sun of winter when you spot something unusual sticking out of a piece of driftwood... 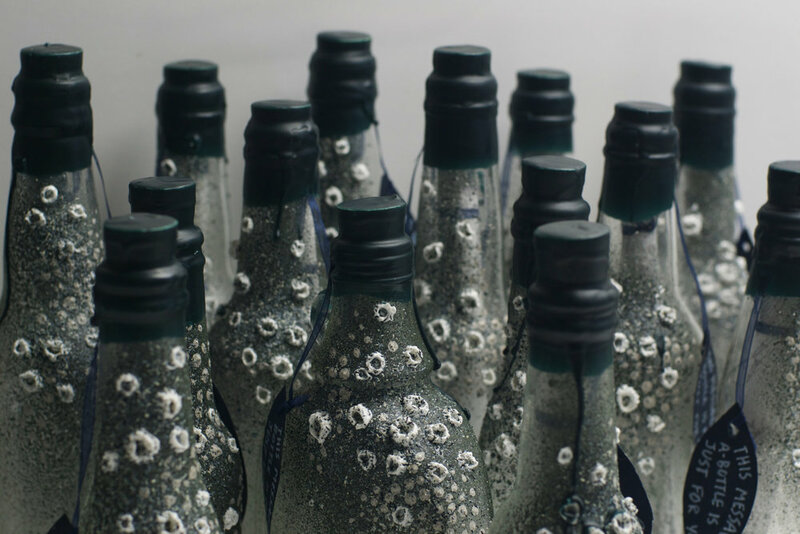 Upon closer investigation, it's a barnacle encrusted message-in-bottle meant just for you! Inside is a hand-illustrated letter inviting you to a surprise event exploring the theme of "what would a shipwreck taste like?" 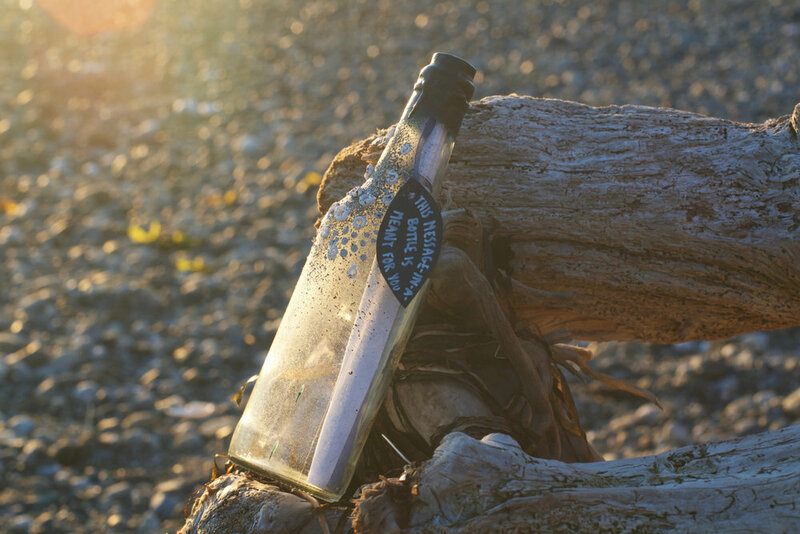 A few curious finders accepted their call to adventure and showed up to the little seaside shack on Camano Island, WA to begin their experience. Together we dined upon rich delicacies that could have been rescued from the depths of the ocean. 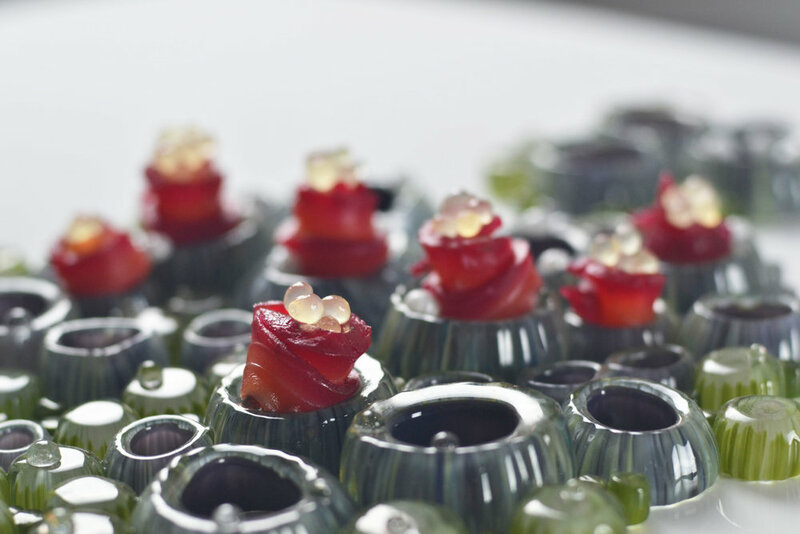 Each course of our tasting menu contained something "rescued" from a shipwreck, something foraged from the land or sea, and some new deep water delicacy. 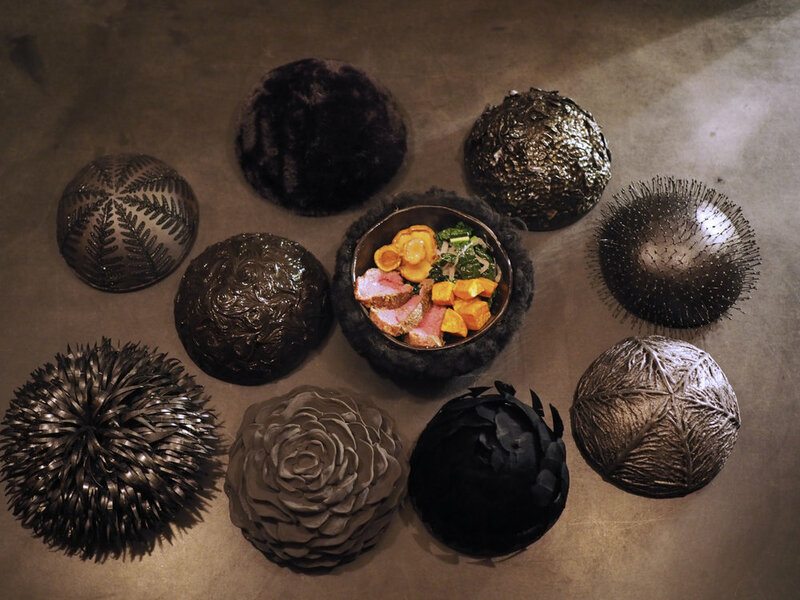 We ate from hand-sculpted porcelain vessels encrusted with barnacles and shimmering with nacre, placed carefully in sunken ships hovering above the floor. We indulged in deep ocean mysteries and let ourselves get lost in the stories hidden beneath the seafoam. Photos by Makenzy Smith of Northwest Focus Co. 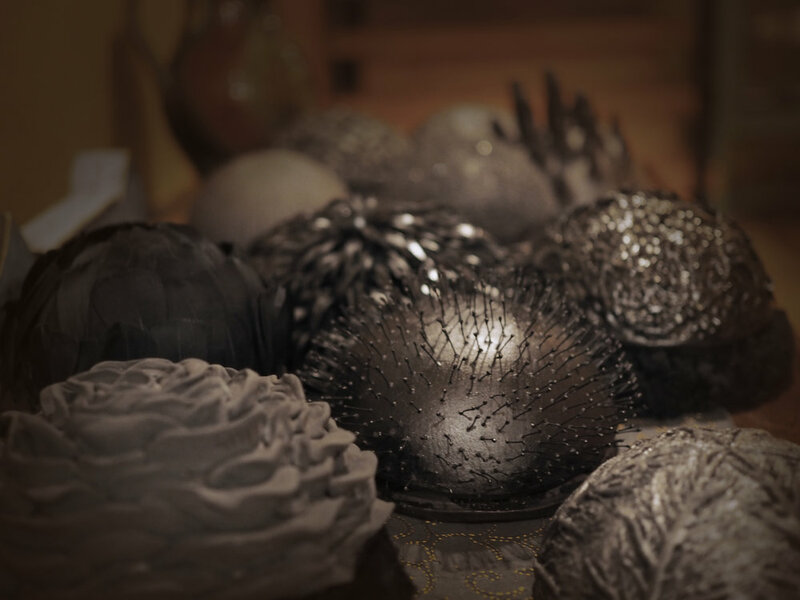 These blown and kiln-altered glass forms were made as part of a residency program at Uroboros Glass in Portland. 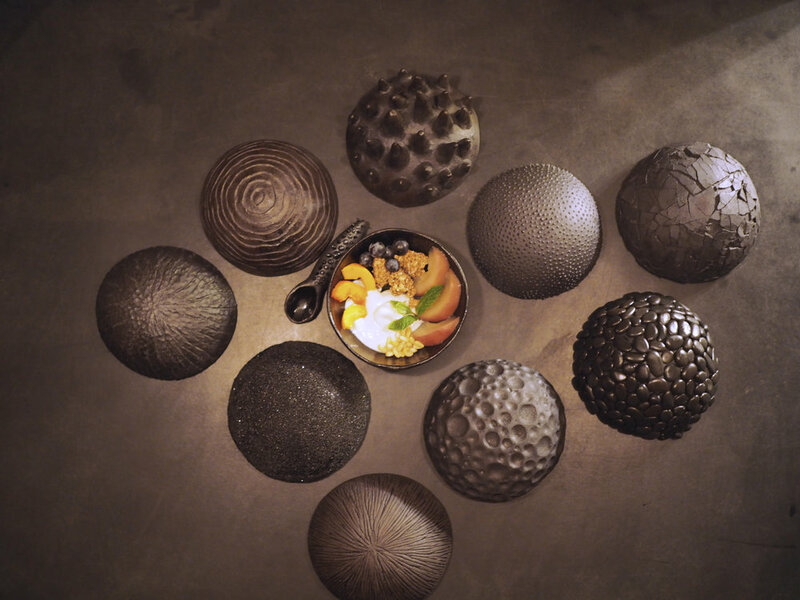 They are formed through a long and careful process of specific heat control and meticulous placement of components. 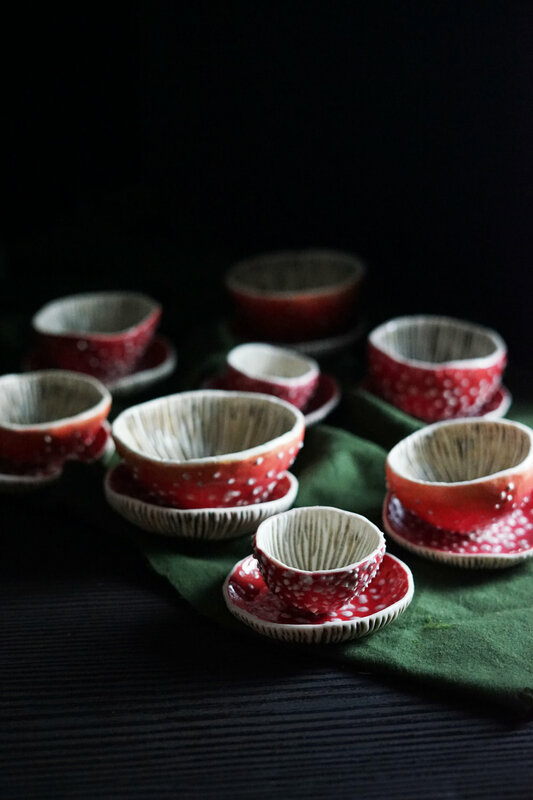 A final firing in the kiln brings them to life as the edges soften and melt just the right amount. 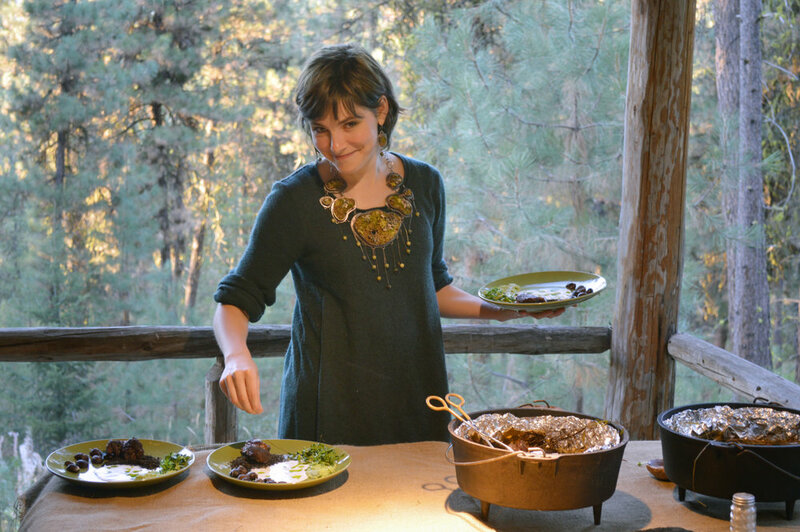 This event took the form of a ceremonial tea party celebrating the beauty after fire's destruction and was appropriately held in the middle of one of America's biggest fires of the year- the Pioneer Creek Fire near Lowman, Idaho. 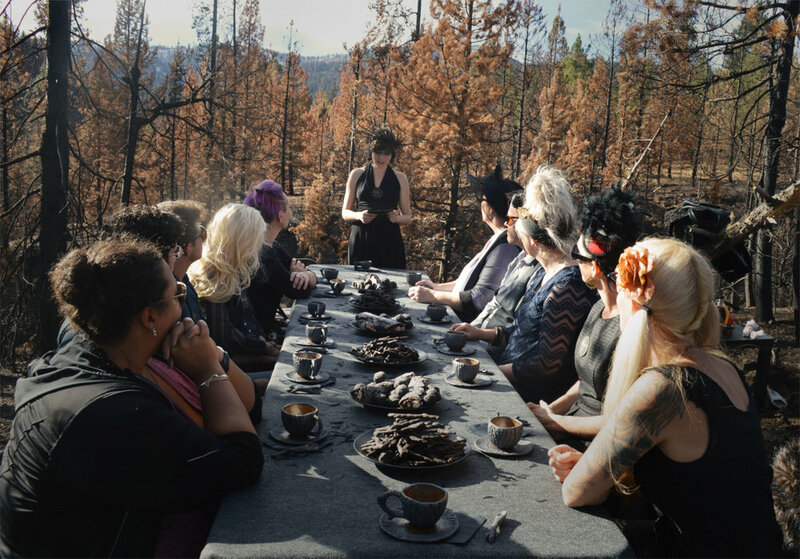 Guests were gifted this experience and joined me in the middle of this charred landscape to enjoy flavorful cups of tea and a discussion about embers. Embers represent a decision: something that has been smoldering under the surface for a long time; will you fan it back into flames, or allow it to die away? I wanted to attract guests who were ready to have a conversation about change and moving forward, so I hid the invitations to this event in the personal growth sections of many local bookstores in Boise. 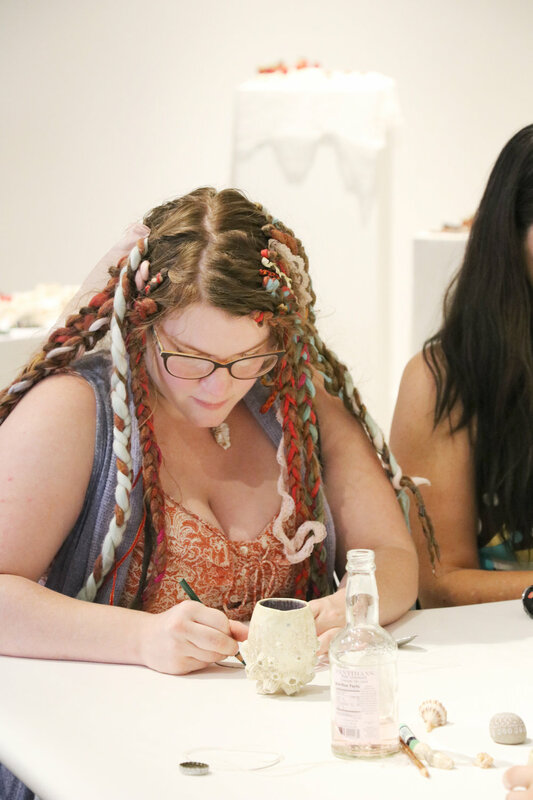 The lucky finders were given an afternoon full of adventure, ash-inspired treats, and artful ceremony. A Pacific Northwest take on the Japanese tradition of “Hanami,” tree-blossom observing. 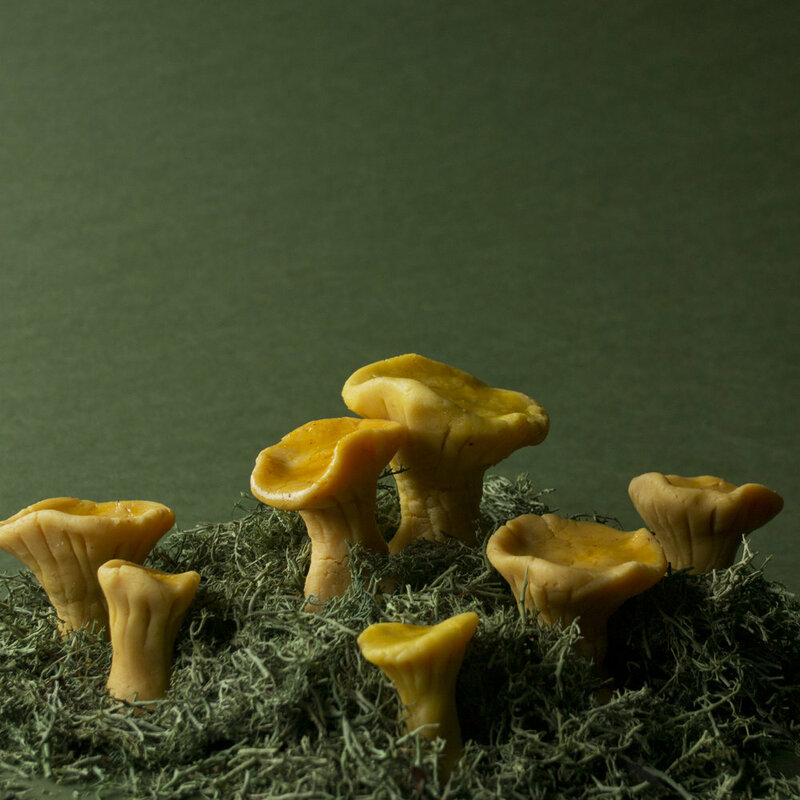 Instead of reminding us of the frailty of life through ethereal blossoms, moss reminds us of the constancy of life through ancient plants. Mosses were the first plants to emerge from the ocean and conquer the land. They range in size drastically and can be found in almost every ecosystem on earth. They have been here far longer than humans have existed. So when life gets overwhelming and my problems seem larger than myself, I escape into the woods and practice the art of moss-gazing. 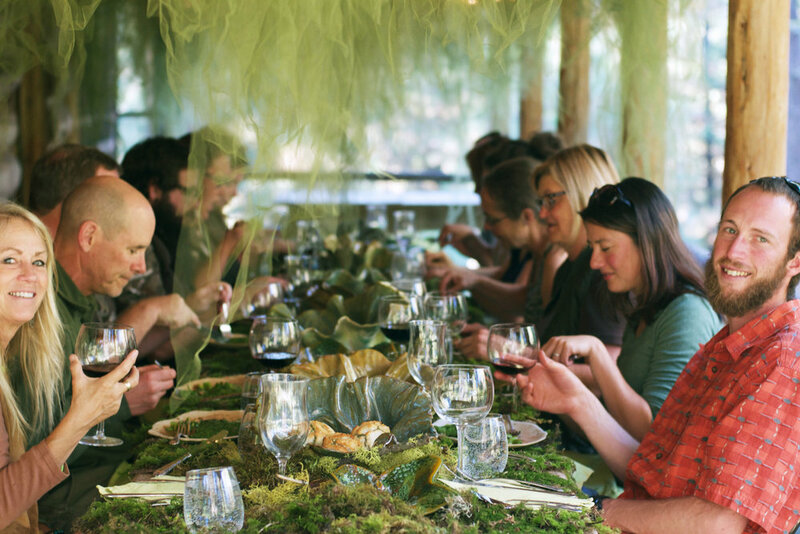 That’s what I invited my guests to do with me this magical night- to make a point to notice the minute and the tiny; the dramatic landscapes found within the soft carpet of moss underfoot and the diversity of flavors hidden under a rotten log. 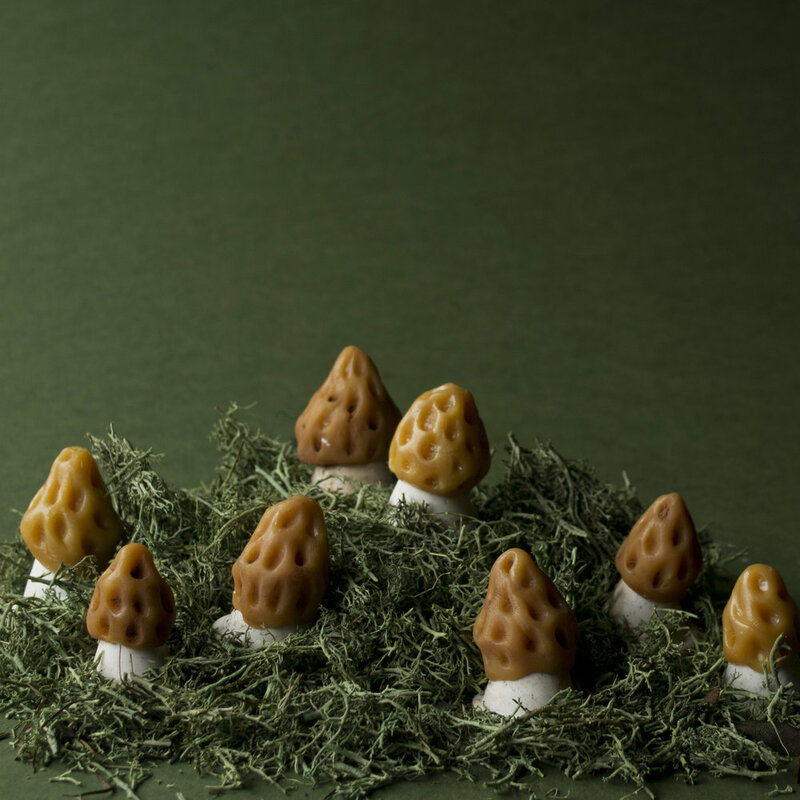 Everything they dined on (and dined out of) was inspired by the delicate wonders of the forest floor, transformed through the poetry of manipulated ingredients and manipulated silica. Just remember, if you’re having trouble seeing the big picture, just look closer. Imagine you are walking through the woods when you spot something unusual: a purple fern growing in a cluster of normal green ones. You get closer to investigate and find an elegantly-written note inviting you to a secret dinner party. Seems like something out of a fairytale, right? Well, for a few lucky people near Eugene, Oregon, it was a reality. These curious hikers celebrated May Day with Lady Fern herself, enjoying a meal of all-purple foods flavored with the plants from these very forests. Photos by Mike Bragg.